You can listen to or down load tracks here. Gordon Smith “The Essential”. Note 2009. Excellent British bluesman with a long wide music career in his back, totally consolidated with endless shows in bars, pubs and taverns around United Kingdom and many European countries. For recording this new album, Gordon Smith has recruited a bunch of good British musicians, such as Dino Cocia on drums and percussion, Alan Glen and Wust Weston on harp who plays piano together with Bob Adheri-, Bernie Pallo on accordion, John O’Reilly on guitar and the bass players Jim Mercer, Rod Demick, Jim Ydstie and Lakis Economou. All them give the perfect support to this restrained well qualified album of pure explosive blues, performed with passion, feeling and devotion to this musical style few artists nowadays posess. The blues appears and flows in every single note Gordon Smith and his musicians play, not only in their own songs (“Ladybird”, “Hey Renes”, “Rev-ing Up”), but also in versions of classic songs coming from Muddy Waters, Lery Carr, Robert Lockwood Jr, Lowell Fulson, Sleepy John Estes or Reverend Gary Davis among others. In short words here comes an album conceived under the basis of deep love to the blues. Gordon Smith has never to my knowledge been mentioned even as an after thought when the greats of British Blues are discussed. A contemporary of Eric Burdon et al in the North East of England, his move to London In 1967 saw him develop into a bluesman of such quality that he recorded for Blue Horizon and rubbed shoulder with peers such as Peter Green. He was a Kevin Coyne sideman for many years. Yet only now, thanks to Note Music have Smith’s considerable talents been made available to the masses, and The Essential Gordon Smith is a Blues master class. Equally at home playing delta or urban Blues, laying out fluid lead lines or searing Bottleneck figures underpinning his gritty Vocal rasp. Smith treats us to a menu of lovingly arranged and produced standards from giants of the genre (Sleepy John Estes, Muddy Waters, Reverend Gary Davis and Others) as well as three original tracks and 'Hungry Man' by harmonica man Alan Glen. It is Impossible to nominate album high points for this collection oozes high quality. Much to the credit must go to producer and drummer Dino Cocoa who’s intuitive, crisp production - giving the impression that the musicians are playing spontaneously live in the studio Is exemplary. When Gordon Smith released his first album, he had the backing of Peter Green and other lads from Fleetwood Mac. That was 41 years ago, and since then the London-based musician has played together with Kevin Coyne and yet has vanished again and again from the Blues scene. Now he is back after a long break, reinterpreting a couple of songs that he sang right back at the start, but he also has other classics to hand, as well as a couple of self-crafted works. Supported by lesser-known musicians such as Alan Glen or West Western, there are superb cover versions of legends from the prewar blues  Blind Lemon, Sleepy John Estes, Robert Johnson  an electrically-charged tribute to Muddy Waters, a splendid swamp number from the Chenier stables or a rag à la Rev. Gary Davis. Gordon’s home-grown material with its clever acoustic slide play is a treat for fans, the arrangements are just right in every respect and the singing is mature. If Smith focused wholly on his talent as a songwriter and set the cover versions aside, that would be the prelude for a perfect album. British singer and guitarist Gordon Smith was guaranteed some form of immortality when he recorded the album "Long Overdue" for the legendary Blue Horizon label in 1968. He has recorded sporadically over the intervening years and this set consists mainly of newly recorded material though with some older tracks from 1997 and 2001. It shows Gordon both in a rural blues mood - the opener, "Kid Man Blues", is an excellent example of just how good Gordon can be on this kind of material, whilst Gary Davisís "Slow Dragí"is a finger-picking tour-de-force, of course ñ and a more urban setting. For the latter try his cover of Muddyís "She Moves Me" with its excellent slide, the fine up tempo shuffle of "Take A Little Walk With Me" op the heavy Chicago approach of Alan Glen's "Hungry Man" (and Alan contributes his customarily excellent harmonica to eight tracks on this album) . Clifton Chenier's "Coming Home" hits a fine Louisiana zydeco groove (nice under-stated accordion from Bernie Pallo), though I am not to sure about the revival of "Tomorrow Nightí" That aside, this set is an unqualified success! This superb pure Blues album is a compilation of fifteen tracks performed by Gordon Smith, an artist whose name is unfortunately not as yet very well known on this side of the Channel. And what a shame it is! Here we have somebody who plays an authentic Blues with roots running deep in the Delta. There is a subtle mix of covers with Gordon’s own compositions. Indeed Gordon Smith’s songs could just as well have been written in the middle of the night, after a long and tough day picking cotton. You could be forgiven for thinking that ‘Ladybird’ had been written by the author of ‘One Dime’ (a Blind Lemon Jefferson creation) when, in fact, it is 100% Gordon Smith. I bet you’re impressed! And I must mention the brilliant English harmonica maestro, Alan Glen who is so present in this great album. In fact, Gordon Smith has invited some big names to join him: Alan Glen on harmonica and guitar, West Weston on piano and harmonica, Bob Haddrell on keyboards, Bernie Pallo on accordion, John O’Reilly on the six-string, the excellent Dino Coccia on drums and no less than 4 bass guitar players! I told you you’d be impressed, didn’t I? And what about the covers? Well, Gordon Smith and his guests put on quite a show with huge songs like ‘She Moves Me’ (Muddy Waters), the classic ‘Careless Love’, ‘Slow Drag ‘ by Reverend Gary Davis or ‘Walkin’ Blues’ by Robert Johnson, combined to ‘Coming Home’ by Clifton Chenier and ‘Hungry Man’ written by Alan Glen. You’ll know by now that this is not only an excellent Blues album but it is also an amazing compilation of great historic Blues songs beautifully performed. An unmissable album! Gordon Smith is perhaps best known as the guitarist of the blues oriented Kevin Coyne Band, but before, during and after that period he made a number of (partly acoustic) blues albums. As a young man he was discovered as a true talent during the British blues boom of the 1960's. While the British blues bands attracted more attention, he also was a recording artist for the famous Blue Horizon label, accompanied by e.g. Peter Green on those recordings. 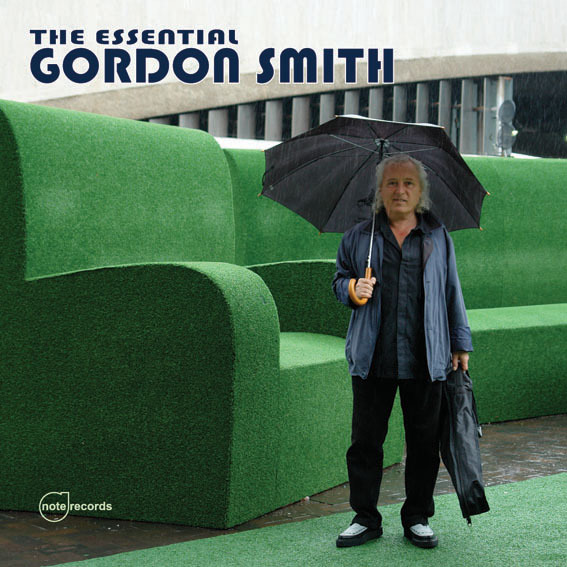 On this excellent new album - called The Essential Gordon Smith - we can hear him with new interpretations of five songs that he earlier recorded during his career: One Dime Blues (Blind Lemon Jefferson) in 1968, Take A Walk With Me ( Robert Lockwood jr) in 1979, Talkin' Woman Blues (Lowell Fulson) in 2002, Hey Renee (Gordon Smith) in 1980 and Walkin' Blues (Robert Johnson) in 1968. This certainly isn't an album recorded in just a few days. It took four sessions, two studio's and two producers to finalise it. So, another ten takes are completely new to Gordon Smith's repertoire. Apart from two tracks featuring Bernie Pallo on accordion, the remaining songs show Gordon Smith backed by the Barcodes ( THEIR latest release: Live in Session for The BBC ), with a prominent Alan Glen ( ex-Yardbirds) on harmonica. You might question another version of Walkin' Blues ? - Well, then you're wrong. This knock-out version is already recorded in 1997 with West Weston on Harmonica. He's also playing the piano on She Moves Me (Muddy Waters) and Take A Little Walk With Me. That particular session is rounded off by Gordon Smith solo on Slow Drag (Reverend Gary Davis). For me just this session would be worth the price of buying the album. But there's so much more to enjoy. e.g. Compare Gordon Smith's version of Tomorrow Night (Coslow/Grosz) with Bob Dylan's. Really, after listening to the first two tracks: Kidman Blues (Sleepy John Estes) and One Dime Blues, one can already be sure - this is pure gold. For me, this is one of the finest UK blues releases ever ! So, I love every minute of it. This Album is going to surprise you: if you thought that something called “The Essential Gordon Smith” was likely to be a bit dull you might be forgiven. 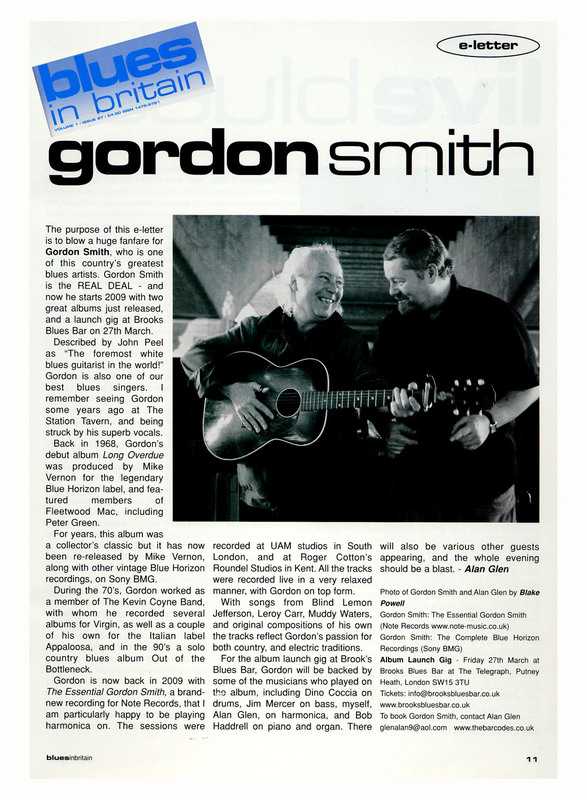 With the kindest of interpretations the name Gordon Smith when applied to a muso, doesn’t exactly sing. My own footprint, John Smyth (pronounced Smith) doesn’t leave a mark on the memory that’s hard to erase. So, let’s find a more memorable name for Mr Smith. A few that occur to me: Gordon “Pigfoot” Smith. Gordon “Bullfrog” Smith, or maybe, Gordon “Umbrella” Smith (see CD Cover). Gordon “Hogsnavel” Smith  I like that one. Hogsnavel has a pedigree to match the best bluesmen on the circuit and, even more to the point, has the skills to do the same: he has a good, travel worn and dusty voice, and boxcar pickin’ to complete the set. He’s is also a mean man on single strings as you’ll hear in his beautiful slide playing and particularly eloquently on the track “Tomorrow Night” where erstwhile blues players will find enough lovely lines, accents and lilting feel to keep them smiling (and humble) for a long time. The musicians backing him up are in the words of our Tina  simply the best. Mention for instance Alan Glen and West Weston on Harmonica and you get the picture. Buy the CD folks, and figuratively open the Christmas Boxes to discover what other goodies await you. Sum up: Traditional blues player by a master, and music that validates the heartfelt wish to see an old, battered but beautiful genre kept alive and kicking like a mule. This is the same Blues that walked juke joint floors and crossed America on the first trains. That musicians from Britain have captured its spirit so completely and with such fidelity proves that the Blues may have it’d established origins but its gifts are bestowed without favour and are distributed universally. Forgive my irreverence about the album title, in these days of endless power trios playing 70’s rock masquerading as blues, I really don’t care whether you’re called Gordon Smith, Winston Smith or Bessie Smith - Just keep on truckin’. Surrey's note-records promises 'the best in blues, soul and jazz' on its web site from an impressive roster of musicians all based in southeast England. Aimed at the dyed-in-the-wool bluesers, The Essential Gordon Smith combines sessions from 1997, 2001 and 2008, all produced by drummer Dino Coccia. The three earliest tracks first saw light of day on Coccia's Widespace CD. Singer-guitarist Smith performs a solo reading of Muddy's "She Moves Me" and 14 numbers with band backing (Rod Demick and West Weston on the earliest session and various Barcodes and Blues Puppies on the later dates). Although highly regarded, Smith's discography is modest for one who has been in the business for 40 years. I hope that these recordings and the recent reissue of his debut album on Blue Horizon will bring his name to a wider audience.